The picture which holds traditional philosophy captive is that of the mind as a great mirror, containing various representations - some accurate, some not - and capable of being studied by pure, nonempirical methods. Without the notion of the mind as mirror, the notion of knowledge as accuracy of representation would not have suggested itself. Without this latter notion, the strategy common to Descartes and Kant - getting more accurate representations by inspecting, repairing, and polishing the mirror, so to speak - would not have made sense. I want to concentrate on the views of another of the critics of the tradition of the 'mirror of nature', namely Hilary Putnam. My main reason for concentrating on Putnam is that his arguments introduce us to two themes that will reappear in various guises at a later stage. The first of these is that there is no single 'correct' description of reality; and the second is that our objectifications of things as entities, separated out from the rest of reality, depend on our cognitive processes, which in turn arise from our interactions with the world. I will therefore not be primarily concerned with ascertaining whether Putnam's arguments are technically correct or not - to an extent I am taking the broad thrust of his conclusions for granted, for the reasons set out in the Introduction. Putnam argues against a stance which he believes has been the default for modern philosophers, and which he terms 'metaphysical realism'. This is a position that Putnam himself once espoused, but which he has subjected to a sustained critique since the mid-1970s. Metaphysical realism is broadly similar to Rorty's 'mirror of nature', and is characterized by the following three theses: (i) that 'the world consists of a fixed totality of mind-independent objects', (ii) that 'there is exactly one true and complete description of the way the world is', and (iii) that 'truth involves some sort of correspondence' (Putnam 1990, p. 30). It is important to make clear at the outset that Putnam isn't arguing against a position that has been definitively held by any particular philosopher; his point is rather that metaphysical realism represents the underlying assumptions that inform the current approach to analytic philosophy. One can certainly criticize Putnam's arguments by attempting to show that it is possible to adopt a moderate form of realism without fully accepting Putnam's alternative; a good, recent example is Khlentzos 2004a. However, I aim to make use of Putnam's arguments in order to display the difficulties associated with the idea that 'the truth' reflects, or corresponds to, 'reality'; a view that is almost a truism in its everyday sense, but which is problematic when taken as a form of metaphysics. My consideration of metaphysical realism is therefore, firstly, an initial stepping stone enabling me to introduce ideas that I will later explore in more detail and, secondly, aimed at undermining any resistance to those ideas that is based on the view that reality is surely just a reflection of the sum total of our (true) descriptions of the world. But what is the relationship between the three tenets that are taken to comprise the metaphysical realist position? Each single claim does not logically necessitate the others, but Putnam believes (1990, pp. 30-31) that there is a natural fit between them. First of all, an obvious way (but not, he admits, the only way) to make sense of how there can be 'exactly one true and complete description of the world' is as follows: if we assume a definite set of individuals that constitute the world, together with a definite set of properties and relations, then a language that contains names for each and every individual, and predicates for each and every property or relation, can provide a true and complete description consisting of the set of true sentences concerning the world. In other words, thesis (i) provides the backdrop to understanding thesis (ii). It is then natural to identify the individuals with the names, and the predicates with the properties and relations. In other words, (i) plus (ii) naturally suggest thesis (iii). Putnam also notes (1983, p. 211) that a correspondence theory of truth requires a 'ready-made world', otherwise any number of different structures might 'copy' the world, and truth would lose its non-perspectival character. In other words, (iii) suggests (i). Putnam contrasts metaphysical realism with a position that he terms internal realism,1 which holds that the question what objects does the world consist of? can only make sense within a theory or description. This alternative stance implies that there is no 'God's Eye View' that represents true knowledge (Putnam 1981, pp. 49-50). Therefore Putnam's position is not a denial of realism tout court; he emphasizes that there is a reality separate from our own thoughts, but maintains that there is no single, objectively correct, description of that reality from an external point of view. Putnam has used a number of different arguments to criticize metaphysical realism, of which I want to consider two. The first of these is described as the model-theoretic argument. Secondly, there is Putnam's discussion of conceptual relativity. The model-theoretic argument has occasioned a large volume of commentary in the philosophical literature; the argument from conceptual relativity is, however, equally interesting - indeed Ernest Sosa, in his review (1993) of Putnam's critique of metaphysical realism, suggests that the case based on conceptual relativity is easily the most persuasive. To see more clearly how both interpretations can produce the same set of true sentences, we should note that the Greek letters are simply placeholders (in Iseda's example, 'alpha' is actually the entity 'Nana'). So it makes no difference whether it is 'alpha' that is Nana or 'epsilon' that is Nana. 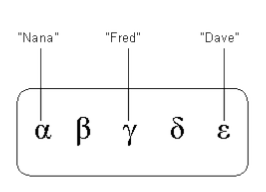 This is even clearer in the diagram below, where the world contains only the five objects (denoted by the Greek letters), but no properties belonging to them; in this case we could not make any statements about the objects, we would only be able to name them ('That is Nana', 'That is Fred', etc.). This makes it clear that the Greek letters identifying the objects have no content and are just placeholders. This characterization of metaphysical realism as an attempt to link two domains, the domain of our descriptions and the domain of objects, needs to be understood in the context of the overall dialectic that drives Putnam's rejection of metaphysical realism. Putnam states in the Preface to Reason, Truth and History that his main aim is to break the hold of the dichotomy between the objective and subjective views of truth, aiming instead for an approach to truth which will try and unite the objective and the subjective and which might be characterized as 'the mind and the world jointly make up the mind and the world'. Much of the discussion that follows in the first three chapters of Reason, Truth and History is intended to show that there are problems with what might be termed 'traditional' theories of truth and reference, for example that 'meanings are just in the head' and the 'similitude theory'. Putnam suggests that, having rejected such 'traditional' approaches, the most common view in analytic philosophy is that an interpretation of a language is fixed collectively by means of operational and theoretical constraints. The attraction of this is that we could, in principle, tell whether a theory is in fact true, since whether the operational and theoretical constraints are met is an empirical matter. But, says Putnam, this view must be incorrect, because it tries to fix the intensions and extensions of individual terms by fixing truth conditions for whole sentences, and Quine has already shown that this does not work. Putnam then uses the permutation argument to extend Quine's conclusion, such that reference of terms is (radically) underdetermined even if we fix the truth-values of all sentences in all possible worlds. I argued [in Reason, Truth and History] that metaphysical realism leaves us with no intelligible way to refute ontological relativity, and concluded that metaphysical realism is wrong. And I still see ontological relativity as a refutation of any philosophical position that leads to it. ... I am happy that most of the readers of Reason, Truth and History (though regrettably not all) understood that my argument was meant as a reductio. In chapter three of Reason, Truth and History, Putnam adds some comments that shed further light on the nature of the difficulty faced by the advocate of metaphysical realism. He points out that we would have no difficulty accounting for how our descriptions can refer to entities in the external world if we were to assume that there existed 'self-identifying objects' or some other form of 'magical theory of reference', but goes on to claim that modern-day philosophers would find such entities unacceptable. This gives metaphysical realists a particular problem because they conceive of language and of objects in the world as two separate realms, and are therefore obliged to give some account of the link between them. However, the only remaining candidate seems to be some form of structural correspondence between the two domains, but it is difficult to provide a coherent account of how such a correspondence can be identified without falling back on objects that somehow identify themselves as matched to our terms of reference. For example, how (on the metaphysical realist's account) can we use the word 'cat' to refer to all, and only all, objects that are cats, unless those objects identify themselves to us as cats? Therefore metaphysical realists are put into the position of wanting to 'think of the world as consisting of objects that are at one and the same time mind-independent and Self-Identifying. This is what one cannot do' (Putnam 1981, p. 54). Putnam provides another way of describing this difficulty: the separation of the two domains means that external reality seems to retreat to a version of Kant's noumenal world, yet it doesn't seem possible to identify the required mapping between our concepts and objects in the noumenal world unless we have direct access to the noumenal objects themselves. '[The model-theoretic argument] simply states in mathematical language the intuitive fact that to single out a correspondence between two domains one needs some independent access to both domains' (Putnam 1981, pp. 73-74). To me, believing that some correspondence intrinsically just is reference (not as a result of our operational and theoretical constraints, or our intentions, but as an ultimate metaphysical fact) amounts to a magical theory of reference. ... Even if one is willing to contemplate such unexplainable metaphysical facts, the epistemological problems that accompany such a metaphysical view seem insuperable (p. 47). That there are correct and incorrect things to say about what expressions refer to is enough for there to be truths - at least on the conception of truth favoured by the internal realist - about reference. ... What, precisely, might be put in doubt by [Putnam's arguments] is the existence of truths about reference in a more substantial sense of 'truth', a concept of truth whose applicability to claims of a certain kind requires, beyond the unimpeachability of those claims in the light of the ordinary discipline that informs their use, some form of robust fit between them and the world. My prognosis is broadly the same as Hale and Wright's. It may be difficult to make Putnam's argument against metaphysical realism watertight, but he has shown there are significant problems with the claim that reference and truth are determined by the external world, independently of our conceptions, and therefore with the view that that there is a single correct description of reality towards which we are impelled by the world itself. (ii) Physicists can construe fields (e.g. an electromagnetic field) either as objects or as constructions using particles acting at a distance. (iii) We can take points as primitive and explain spheres by means of sets of points, or we can explain points from sets of convergent spheres, thereby taking the spheres as primitive. In other words, we can describe space-time by means of points or we can describe space-time using a language that takes points to be simply limits. (iv) Suppose we have three marbles in a box; how many objects are there? A logician who counts mereological wholes as objects would say 'seven', rather than 'three'. Each of us acquires and develops a view of things that includes criteria of existence and perdurance for categories of objects. When we consider whether an object of a certain sort exists, the specification of the sort will entail the relevant criteria of existence and perdurance. And when we correctly recognize that an object of that sort does exist, our claim is elliptical for '... exists relative to this our conceptual scheme'. But if the metaphysical realist were to accept that even such basic properties as existence and cardinality are relative to a conceptual scheme, then the 'real world' as conceived by the metaphysical realist seems to retreat to a totally unknown Kantian noumenal world, with all its attendant epistemological difficulties (Putnam 1976, p. 133). The metaphysical realist cannot accept conceptual relativity because that idea is rooted in the fact that the notions of 'object' and 'existence' have a number of different uses rather than one determinate meaning, and metaphysical realism, if it is to mean anything, must of necessity hold that there is but one meaning of such terms (Putnam 1987, p. 19). Hence, argues Putnam, the fact that conceptual relativity does exist indicates that metaphysical realism is not tenable. Putnam (1994a, p. 309) suggests that the existence of conceptual relativity indicates not that truth doesn't really depend on things external to us but that the nature of that dependence changes as the conceptual schemes that we use change. It is not that we legislate facts by our use of language, but rather that we can only talk of facts once we have adopted a particular way of discussing matters. Therefore one must not interpret Putnam as claiming that, say, the existence of elephants depends upon the existence of humans and their concepts (Khlentzos 2004b). It is quite clear that we can evaluate a possible world without humans and say 'Yes, elephants exist in such a world', because we evaluate from our world, with our conceptual schemes (Sosa 1993). I suggest that the picture of one, unchanging dependence between our language and the world only seems sensible if we imagine ourselves as having some sort of passive existence outside the world. Given such an externalist account, it might seem that the only way for there to be a relationship between our words and the world is for objects to be predetermined in the world, and hence for the dependence of our words on those objects to be some form of correspondence relationship. But if we reject that entire externalist viewpoint, and instead consider that we ourselves are part of the world and are to a large degree constituted by our interactions with it, then the rationale for maintaining that what counts as an object is predetermined seems to disappear. This is an alternative way of viewing our relationship with the world that I will develop further in Section 3: An Alternative Metaphor. Putnam (1987, p. 17) characterizes internal realism as the insistence that realism is not inconsistent with conceptual relativity, i.e. with the view that the world does not legislate precisely how we should use words such as 'object' and 'exist'. So he agrees (1999, p. 7) that knowledge claims must be 'responsible to reality' but points out that the forms of knowledge claims and the ways in which they are responsible to reality are not fixed once and for all. He therefore says (1988, p. 115) that the essence of internal realism is that 'truth does not transcend use'. One advantage claimed by Putnam for internal realism is that reference to external objects becomes straightforwardly explainable because both signs and objects are internal to the scheme of description. To refer back to the problem of the metaphysical realist, whom Putnam characterizes as being forced to maintain that objects are both self-identifying and mind-independent, we can say that for the internal realist, objects are in some sense self-identifying, since they fall under conceptual schemes that we have constructed. But then they are not mind-independent (Putnam 1981, pp. 53-54). Putnam acknowledges (1981, pp. 56-64) that his internal realism owes a substantial debt to Kant, who was the first philosopher to seriously criticize the correspondence theory of truth and to attempt to explain objective knowledge without presupposing that there is a way that the world is that is independent of our own conception of the world. Given that Putnam's views owe much to Kant, it would be useful to consider the manner in which internal realism appears to differ significantly from the original Kantian intuitions. The important difference is that Putnam views the adoption of internal realism as implying the rejection of any Kantian notion of noumena or 'things in themselves'. As he explains it (1981, pp. 63-64), Kant saw the 'power' in the noumenal world to cause sensations as ascribable to the noumenal world as a whole. So if we have a sensation of a horse or a chair, this does not, for Kant, imply there must be 'noumenal horses' or 'noumenal chairs'. Indeed, this is why Putnam says that Kant did not hold a correspondence theory of truth. All one can say, according to Putnam's interpretation (1981, pp. 63) of Kant, is that 'any judgment about ... objects ... says that the noumenal world as a whole is such that this is a description that a [being with our rational nature] given the information available to a being with our sense organs ... would construct.' Kant believed that the idea of a 'thing in itself' might be empty of content, but nevertheless retained the formal sense of the concept within his metaphysics. However, Putnam (1987, p. 36) believes that once we realize that we cannot know the things as they are in themselves, and accept that objects and existence are relative to a conceptual scheme, we can see that the whole concept of something 'as it is in itself' is incoherent, and hence entirely reject the notion of a noumenal world and the resulting metaphysical dichotomies. Having run through Putnam's arguments for internal realism, I now want to discuss two types of objection to this position. The first objection takes the view that the type of metaphysics proposed by Putnam effectively denies that there are 'facts' about the world that make our statements true. Certainly, John Searle takes this to be the case in his discussion of 'anti-realist' positions in Chapter 7 of The Construction of Social Reality (1995). The ontological status of 'facts' is, however, debatable. The usual view of facts is that they are those items in the world that make propositions true, but many philosophers have a concern that this notion too closely resembles that of a true proposition to enable it to play the explanatory role that is required of it (Loux 2002, pp. 164-168). However, Searle (1995, p. 166) wants to clearly distinguish descriptions from facts and states of affairs, claiming that '... we do not make "worlds"; we make descriptions that the actual world may fit or fail to fit'. He adds that, once a conceptual scheme and set of definitions have been fixed, then the aspects of the world that accord with those definitions have an existence that is independent of the definitions. For Searle (1995, p. 166), facts or states of affairs can only be described relative to a set of linguistic categories; they do not exist relative to a set of linguistic categories. In chapter 9 of The Construction of Social Reality, Searle reconstructs the correspondence theory of truth such that it becomes simply a matter of how we use the words 'fact' and 'correspond' when we say that a statement is true if and only if it corresponds to the facts. ... the whole point of having the notion of 'fact' is to have a notion for that which stands outside the statement but which makes it true, ... if it is true. On this account facts are not complex objects, nor are they linguistic entities; rather, they are conditions, specifically, they are conditions in the world that satisfy the truth conditions expressed by statements (Searle 1995, p. 211). So 'corresponds to the facts' is not some strange sort of general relationship that must hold between our (true) representations and reality, but simply a term for the various ways in which statements can represent the world (Searle 1995, p. 213). we must not think that true sentences correspond one by one to special objects which 'make them true', call them 'states of affairs'; for to do that would be to bloat our ontology with what Collingwood called 'a kind of ghostly double of the grammarian's sentence' (Putnam 1994a, pp. 300-301). I conclude that there is no substantive difference between Putnam and Searle on this issue, and that there is little prospect of a strong argument against internal realism based on the objection that it denies widely-held claims about the status of 'facts'. Blackburn writes as if I hold that 'genuinely inconsistent propositions' can be true. Of course, I do not hold this. When I said that propositions which are inconsistent from the point of view of classical semantics can be true, I was criticizing 'classical semantics', not endorsing the conclusion Blackburn ascribes to me (p. 244). As an example, he points out that in a mini-world of three individuals, one wholly red and one wholly black, the statement 'there is an object which is partly red and partly black' is false if our ontology consists only of the individuals, but true if our ontology includes mereological sums. In such cases, suggests Putnam, the propositions concerned should not be conceived of as 'genuinely inconsistent', and it is the different use of terms such as 'object' and 'exist' that blocks any imputation of genuine inconsistency. So Putnam's view is not that there are multiple perspectives that cannot be conjoined; what he is insisting on is that there is no single, privileged ontology from which to derive one, uniquely-true, perspective (1994b, p. 254). Hence there is no genuine inconsistency of propositions, and conceptual relativity, as Putnam conceives it, is not open to the objection that it implies that we have to give up on the idea of a rational approach to knowledge because the logical connectives lose their content (1994b, p. 247). Despite this change in his views, Putnam (1994b, p. 242) still believes that the notion of truth is intertwined with the notions of rational acceptability and sufficiently good epistemic conditions, and with the way that words are used. He believes that he is still arguing for the same conclusion - that the principles of metaphysical realism are incoherent - but in a different way (1999, note 41 on p. 183). Accordingly, I don't intend to enter into a detailed discussion of Putnam's move from 'internal realism' to what he terms 'natural' or 'commonsense' realism. However, I do want to refer briefly to one aspect of Putnam's recent writings on the nature of representation, namely the emphasis that he now places on the relevance of perception. Putnam (1994a, p. 281) says that, after writing Reason, Truth and History, he realized that there was a strong link between the problem of reference and the problem of perception, which is that they are both concerned with the relation between thought and the world. After all, says Putnam, if we didn't think there was a philosophical difficulty concerning how we perceive the world, then we would surely have no problem with how we are able to refer to it. The question 'how does language hook onto the world?' cannot seem problematical unless we have already rejected the response 'how can there be a problem talking about trees and houses, when we see them all the time?' (Putnam 1999, p. 12). He goes on to say that adopting a philosophy that consists of 'Cartesianism plus materialism' implies that our cognitive abilities do not extend beyond our own perceptual inputs, and that the link with the 'external world' must therefore be a causal, not a cognitive, link; and it is this that makes the objective references of our terms appear completely undetermined. This link between perception and reference suggests to Putnam (1994a, pp. 290-291) that part of the reason why it does not make sense to imagine a world where 'cats' refers to cats* rather than to cats, is that it is easy to perceive that something is a cat and not easy to perceive that something is a cat*. Sensory perception is not a passive affectation of some object termed 'the mind' but experiences of the world by a living being. When we talk about the mind, we are actually talking about a set of abilities that depend upon our brains and upon our interactions with the environment (Putnam 1999, pp. 37-38). Once again, this is suggestive of an alternative way of viewing the relationship between our selves and the world, a way that I shall explore in more detail in Section 3.
the phenomena that we now call the phenomena of the material world were not yet in existence: ... because no one was there, there was not ... anything that counted as a volcano, or a dust-storm and so on. I am not suggesting that the world had no substance to it whatsoever. We might say, perhaps, that it consisted of 'worldstuff'. But the properties of this worldstuff had yet to be represented by a mind. I shall be arguing that we need to take the intuition that lies behind these comments seriously (to borrow a phrase used by the philosopher David Chalmers). Putnam has changed and refined his views over the last 30 years, and accepts that the term 'internal realism' has usually been applied to whatever position he has held since he first coined the phrase in his paper Realism and Reason in 1976. He has also said that the connotations of the word 'internal' are unfortunate, which is why he has sometimes used the phrase 'pragmatic realism' (see Putnam 1994a, note 23 on p. lxvi). (i) Realism and Reason (Putnam 1976). This version is stated quite briefly and uses basic theorems from model theory. (ii) Models and Reality (Putnam 1977). This is an expanded version of the approach in Realism and Reason, explicitly employing the Lowenheim-Skolem theorems from model theory. (iii) Reason, Truth and History (Putnam 1981), especially pp. 32-38 and the Appendix. This version has been termed 'the permutation argument' by Hale and Wright (1997), among others. Hale & Wright give two reasons why they concentrate on the permutation variant of the model-theoretic argument: (i) it contains the additional arguments needed to close off various possible ways that a metaphysical realist might evade Putnam's conclusion; (ii) the model-theoretic resources used are much more modest (Hale & Wright 1997, pp. 428-429). Hallett (1994) comments that the permutation version is preferable because it is 'simpler and more general'. Douven (1997, p3) gives a useful example showing how a series of different interpretations can be straightforwardly produced using the permutation technique. As Lakoff (1987, pp. 230-231; see also pp. 252-253) puts it, 'Model theory is ... the natural mathematization of objectivist semantics. What Putnam is suggesting is that there can be no such possible mathematicization. That is, objectivist semantics cannot be made precise without contradiction.' This is also why, at a crucial stage in the argument, Putnam seems to just assume that 'true' equates with 'true on some interpretation'; this is simply what 'truth' is taken to be in model theory (Lakoff 1987, p. 232). The only comment that can be made here by a metaphysical realist is that, although the statements that we can make might well be true on some interpretation, it may not be the intended interpretation. Putnam's response is that, given an interpretation which meets all our operational and theoretical constraints, it is difficult to see what additional constraint there could be on reference that picks out the 'intended' interpretation, and that the supposition that an interpretation which meets all the operational and theoretical constraints might really be false seems to 'collapse into unintelligibility' (see Putnam 1976, p. 126). The onus legitimately placed upon [the metaphysical realist] is not to demonstrate that determinate reference is possible, but to provide a constitutive account which explains how determinate reference works. Accordingly, he is perfectly within his rights to assume, at least pro tem, a metalanguage in which a determinate account of the putative mechanics can in principle be given. ... the kind of causation needed for a causal theory of reference is causal explanation, which is inescapably interest-relative and irreducibly intentional, and hence relative to a language. To argue that there is a sense of 'cause' which escapes this would be to assume that 'cause' is a term whose reference may be fixed absolutely, which would beg the question by assuming what the argument from a causal theory of reference was supposed to establish, namely that there is such a thing as the reference relation—that is, a distinction between a correct and incorrect way of assigning reference (Stoutland 2002, my emphasis). Here the [causal realist] is ignoring his own epistemological position. He is philosophizing as if naive realism were true of him ... What he calls 'causation' really is causation, and of course there is a fixed, somehow singled-out, correspondence between the word and one definite relation in his case. Or so he assumes. But how this can be so was just the question at issue. ... to think that a sign-relation is built into nature is to revert to medieval essentialism, to the idea that there are 'self-identifying objects' and 'species' out there (1983, pp. xi-xii). The point that Putnam is making here is that the causal theory of reference is either (i) an empirical theory, in which case it is caught by the model-theoretic argument, or (ii) it is a theory of direct (or 'magical') reference, in which case it doesn't explain what we wanted explaining, i.e. how signs can refer to a mind-independent world. Secondly, in Putnam 1990 (pp. 82-83) he sets out the issue as follows: (i) the metaphysical realist needs something to constrain the 'true' interpretation to one intended interpretation, (ii) the epistemological situation is such that we have no way of knowing whether the constraint is actually met (due to model-theoretic considerations), (iii) so the metaphysical realist argues that it is not 'our mind' that fixes on the correct reference relationship, but the world itself (i.e. the constraint is out there in the world), (iv) but this idea that the world has a semantic element to it is contrary to our modern-day physicalist understanding, (v) so you cannot be a metaphysical realist and a physicalist. Putnam goes on to say (p. 85; see also note 9 on p. 328) that what he finds unintelligible about the causal theory of reference is the idea that one relation is intrinsically capable of fixing reference all by itself, without any supposed 'metaphysical glue'. Thirdly, let's consider once again Putnam's dialectic in the first three chapters of Reason, Truth and History. As I interpret Putnam's discussion here, the underlying problem with metaphysical realism is the separation of the two domains of words and objects. This separation coexists with a purported link between the domains, a link which is supposed to constitute reference and which is therefore usually held to determine meaning and truth. But the separation of the domains leads to an obvious and troubling question, namely 'how are meaning and truth possible? ', to which there seem to be a small number of alternative approaches. Firstly, one can hold that meaning and truth reside wholly in the domain of words, in which case the separation of the domains is irrelevant. This is the stance to which Putnam's 'Twin Earth' argument is directed (1981, pp. 18-19), with the conclusion that 'meanings aren't just in the head'. Secondly, one can suppose that there just is a link between the two domains. But simply stating that there is such a link between the separate domains doesn't appear to help us much. Here we seem to have two choices: either we can say that the link is of a specific type, e.g. a causal link, or we can think of the link's existence as some sort of basic metaphysical fact that is a part of the nature of the universe. If we choose the first alternative, then in the view of Putnam, we are thinking of the relationship as lying in the domain of objects. For example, he says (1983, p. 207) that any specific correspondence relationship 'being a relation to things which are external and mind-independent, is itself something outside the mind, something "external"!' But if the causal link itself lies in the objects domain, then our problems with reference reoccur; presumably, we can try and identify the existence of the link by means of operational and theoretical constraints, but now this reference is radically underdetermined. This is, of course, precisely where the 'just more theory' argument occurs in Putnam's dialectic. Rejecting a causal link leaves us with the second of the two choices, namely that reference is a brute, metaphysical fact. Putnam clearly rejects this position on the grounds that (i) it is a reversion to an outdated ontology, and (ii) it does not provide any explanation of reference. If we choose this alternative, we don't have a problem of reference as such, but we have major epistemological problems and seem to have adopted what Putnam terms a 'magical theory of reference'. In fact, Putnam doesn't believe that any modern philosopher will actually adopt this position. He says (1981, p. 51) that modern realists have a problem because they want a correspondence theory of truth, but being materialists they find the notion of self-identifying objects (or other forms of magical reference) objectionable. Ultimately, the modern day metaphysical realist seems to be forced back to mapping between concepts and things, which Putnam has shown leaves reference underdetermined. See Putnam 1987, pp. 17-21, 32-36; Putnam 1988, pp. 110-116; Putnam 1990, pp. 96-104; Putnam 1992, pp. 115-123. For an informative account of Putnam's transition from 'internal realism' to 'natural realism', see Maitra 2003, especially pp. 66-71.